established in 2001 and serving fresh indian cuisine with original recipes from india. Good food, a bit different from your run of the mill Indian food. Quite a small menu, but what we had was delicious. However, although the Thalis gave a range of dishes to try, would perhaps have liked to be able to try more of the single item dishes but as the portions are quite large it meant we were a bit limited. Would definately go again though and would recommend. I was very disappointed with the service. Our waitress not only forgot our appetizers she also ignored us for 30 minutes after our main courses had been cleared away. I spoke to the restaurant manager and explained that the this was disappointing and had put a downer on my wife's birthday. I requested the bill which was brought by the same waitress who then proceeded to accuse me of having a personal dislike of her. This was totally unacceptable and her behaviour was inexcusable. I am not responsible for her failure to be professional and am very angry and annoyed by her actions. The fact that you gave us our wine does not make up for her behaviour. On returning home I checked the bill only to discover she had charged us for appetizers that we didn't receive. Quite frankly this only serves to underline what a poor night she had. We came to Indian Summer as a large party of 12 on a busy bank holiday weekend. The food and service were absolutely outstanding! We decided to try the sharing menu which was incredible value and allowed us to sample lots of dishes. The staff were very attentive, popping back frequently to top up our wine and water. The restaurant is beautifully decorated too. I would hightly recommend a meal here. Thank you! As always a great time was had , cannot fault anything Tim and his team were wonderful as was the food . Food fabulous, service good too. We were situated to the rear of the restaurant which has very little soft furnishings. We were a table of two next to several large noisy tables. This spoilt the evening for us and would urge the management to locate tables for two away from the larger groups. The food was fantastic but the experience was poor due to this factor. 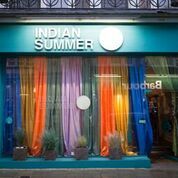 We have been coming to Indian Summer for many years but will start to look elsewhere in future. A thoroughly enjoyable evening with great food and service. We have been 3 years running after the Brighton marathon. Nice atmosphere, quality food and drink, excellent service. However, it has become very expensive for what you get. Sadly, it's unlikely we will return. Superb - more like a restaurant in India than an Indian restaurant! I've been to the restaurant several times and will no doubt come back, but I found my dish very disappointing on this occasion. I had the Hyderabadi Murgh, as did my partner, and we both found it rather bland. The roti tased fine, but was a bit soggy, which might be due to serving in in the tiffin tin. The vegetarian and prawn Thalis were delicious. Excellent service. Lovely place to go for lunch. Always really fresh and tasty food. Staff are always really friendly too. Very nice food as always, quick food and friendly staff! I do think Indian Summer is the best Indian in Brighton. We all really enjoyed our meal. We were a little overlooked when we finished our meal as noone came to our table and we had to get up to ask for the bill but apart from that the service was excellent and definitely would recommend the restaurant. Sadly many of our party were disappointed in our food, especially when after a significant wait for starters some of the chicken lolly pops were raw! The service over all was very slow. I appreciate we were a large group, but there were only a few other tables in, and you have a Gordon Ramsey simple menu. We waited ages again for the mains. We had to ask to order extra drinks and over all my parties comments were that the experience  of dining with you was poor. Excellent meal with attentive service as usual. Easily catering for the Vegetarian, Vegans and meat eaters in our party. Best Indian cuisine in Town.